Elected to the Thirty-first Parliament for Lower Central Province from 2 May 1983 in succession to Winifred Margaret Piesse (defeated). Elected to the Thirty-third Parliament for South West Region from 22 May 1989. 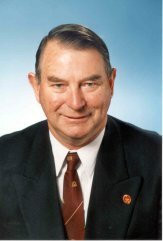 Re-elected 1993, 1996, 2001 (for term commencing 22 May 2001). Retired 21 May 2005. Deputy Chairman of Committees: 22 June 1993 - 10 February 2001. Shadow Minister for Agriculture; Conservation and Land Management: March - December 1986. Secretary to the Shadow Cabinet: 7 March 1989 - 24 May 1992. Member, Standing Committee on Government Agencies: 15 October 1985 - 1986. Member, Sub-committee of Standing Committee on Legislation dealing with Limited Partnerships Bill 1992: May 1992. Member Standing Committee on Legislation: 3 August 1993. Member, House Committee: 23 June 1993 - 10 June 1998. Member, Standing Orders Committee: 23 June 1993. Member, Standing Committee on Legislation: 31 May 2001 - 23 January 2005 (membership ceased on prorogation). Member Select Committee on Aboriginal Poverty in WA 1984–1985. Chairman Select Committee on Spread of Dieback in National Parks and Conservation Reserves May 1991 – 22 September 1992. Member, Parliamentary Services Committee: 11 June 1998 - 10 January 2001 (membership ceased on prorogation). Reappointed 28 June 2001 - 23 January 2005 (membership ceased on prorogation). Secretary Parliamentary Liberal Party from March 1989. Secretary Parliamentary Coalition from 24 November 1992. Represented WA branch Commonwealth Parliamentary Association at the 20th Australasian and Pacific Regional Conference, Kiribati, 1989; at 36th General Conference, Harare, Zimbabwe, September 1990; at 22nd Australasian and Pacific Regional Conference, Sydney, August 1993; and at 42nd General Conference, Kuala Lumpur, Malaysia, 1996. Born 17 March 1935, Ballarat, Victoria. Arrived in Western Australia 1954. Farmer - Mobrup - grazier and farm contractor. South West Region includes the Legislative Assembly electorates of Albany, Bunbury, Collie, Dawesville, Mandurah, Mitchell, Murray-Wellington, Stirling, Vasse and Warren-Blackwood. Enrolment (14 December 1996) 134,939; area 44,518 sq km.